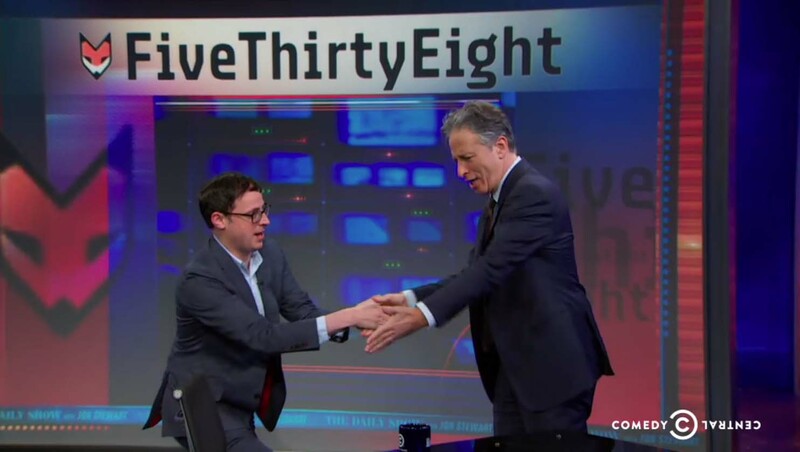 I developed the lettering portion of the logo for Nate Silver’s relaunched FiveThirtyEight. Creative Director Kate Elazegui wanted the lettering to have a “data” feel to match the editorial mission of the site. I thought that echoing monospaced fonts would be a good way to give it the right undertones. The tricky thing was that “FiveThirtyEight” has several of the letters that make monospaced fonts look, well, awkwardly spaced at large sizes. I had to find ways to make the really narrow letters like the “i” look like they were occupying the same amount of space as the wider letters like the “g”. It was a fun challenge and I’m really happy with the way that it turned out. I think it fits into the overall site quite nicely. As part of the promotional push, Nate Appeared on The Daily Show and I achieved my lifelong dream of having a weird “g” that I drew float over Jon Stewart’s head. That image is copyright Comedy Central, The Daily Show, Jon Stewart, etc., of course.